Nathalie and Alain invite you to discover a haven of peace and tranquillity where you can relax during on family break or as a romantic break for two. 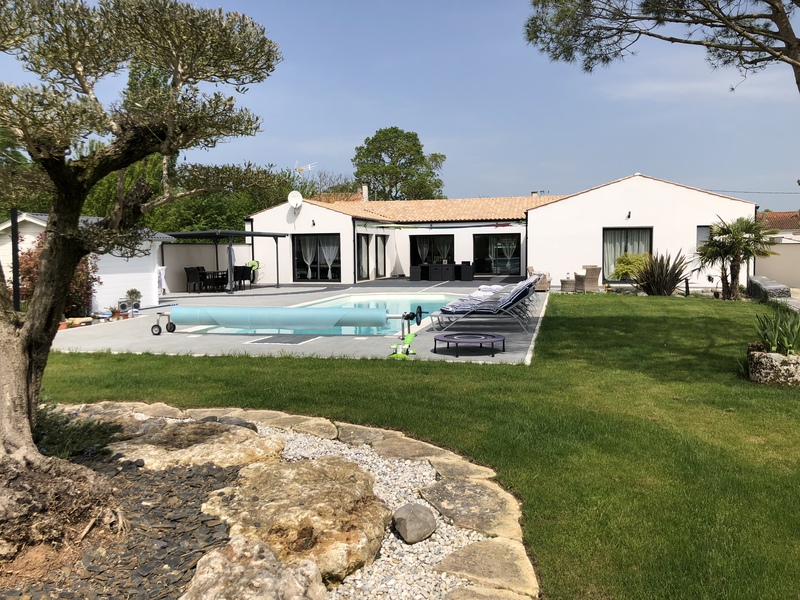 Located in the town of Le Thou 22 kilometres from La Rochelle and 19 kilometres from Rochefort, near the Marais Poitevin and near the Île de Ré, the Maisonnette du Bois offers a quality stay focused on well-being. Whether with your family or just as a couple, Nathalie and Alain invite you to enjoy a family house of 200 square metres on a plot of 4,000 square meters, with a salwater pool heated from April to October (12 x 4 m) surrounded with a landscaped garden, a patio complete and a children’s trampoline, an adult trampoline, a “boules” pitch, a hut for children stocked with board games (sets of skittle, pucks), a garden, a pond with ducks where you can fish and a large chicken coop. The Maisonnette du Bois offers three spacious contamporay rooms (ranging from 20 to 25 square metres) with private bathrooms (with toilet, shower and bathtub) and a private patio area. All rooms have secure WiFi and are equipped with a flat screen TV, digital terrestrial TV and a tea maker. Breakfast is included and is served between 8am and 10am. A courtesy tray will be provided upon your arrival. A free parking space is available and there are facilities for bicycles and motorbikes. After a breakfast served either indoors or on the patio (depending on the weather) to allow you to enjoy the panoramic views, you can discover our region : les marais Poitevin (swamps) (Marans, Coulonges), salt marshes (swamps , bird sanctuaries (located between Rochefort and Marennes-Oléron), centres rich in history (La Rochelle, Rochefort, Saintes, Surgères, Bordeaux), Islands (Île de Ré, Île d’Oléron, Île d’Aix, l’Île Madame, Fort Boyard) either recover at the edge of the swimming pool (assured tranquillity). You will appreciate our beaches (Chatelaillon or les Boucholeurs (petite crique)) in about fifteen minutes of the house, but by windy time, we advise you our swimming pool and terrace closed due south. NB: To ensure the peace and tranquillity of all our guests, only small animals are allowed on our premises. We also offer table d’hôtes meals every night to share a dinner with you and get to know each other better. We would appreciate it if you could inform us in advance of your approximate arrival time. You can indicate this information in your booking email or contact us direct. We invite you to discover more about our house and our universe on the following pages. Please do not hesitate to contact us and enjoy your visit!